Stop # 1 – The Maryland Firefighters Memorial (5 minutes) – This memorial titled Between Morning and Night was sculpted by Rodney Carroll, recognized nationally for his large scale sculptures. The memorial was dedicated on June 11, 2006. Louis L. Goldstein Statue – This eight foot bronze statue by sculptor Jay Hall Carpenter, elected into the National Sculptor Society before the age of thirty, memorializes Louis L. Goldstein, a native of Calvert County, Maryland, Marine Corp veteran, lawyer, legislator, and Comptroller of Maryland from 1959 to 1998, the longest serving public official in the State. The memorial statue was dedicated on April 3, 2002. Louis, as he was affectionately known, always greeted friend and stranger alike in the same way: “God bless you all real good.” Over the years, he became synonymous with his friendly greeting and he even handed out carnival coins wherever he went with his title on one side and his greeting on the other side. Louis was a true Maryland character and much beloved. The March on Washington Foot Soldiers Memorial – This three panel granite monument standing seven feet tall in Whitmore Park celebrates the 50th anniversary of the Civil Rights March by 200,000 marchers in Washington, D.C. The monument includes the names of 500 Annapolitans who took buses from this corner in 1963, and heard the Reverend Martin Luther King speak “I Have A Dream.” The “foot soldiers” memorial was unveiled on August 28, 2013. Calvert and Clay Street Mural - Community Rising – Stanton Center students under the direction of artist George Belt, created the mural which was commissioned by the Art in Public Places Commission in 2008. The Old Fourth Ward – Maryland artists Cynthia Ward Rankin and Diane Monday collaborated in this work of social history, depicting community life on Clay Street at the end of the 20th century, commissioned by the Art in Public Places Commission in 2004. The all volunteer-run Chesapeake Ecology Center @ Adams Academy features several Bayscapes gardens, a Rainscaping demonstration project, the Blacks of the Chesapeake Program, and a unique ecology center at a county school facility located on lovely College Creek in the midst of a historic African-American community. Ride around the 1.3-mile bike/ped trail created through a unique partnership between the Naval Academy Athletic Association, the City of Annapolis, the Weems Creek Conservancy, Baltimore Gas Electric, and the TKF Foundation, showcasing multiple raingardens, extensive native landscaping, the removal of impervious surfaces and creation of athletic fields, dog litter stations at the Naval Academy Marine Corps Stadium. Hear the story about the first of its kind cooperative tree planting demonstration project between the City of Annapolis, the Maryland State Highway Administration, and Baltimore Gas Electric along an old rail line and active utility corridor that has been converted into the Poplar Trail. Learn about how non-native plants, like bamboo and English Ivy are taking over America, and view one of several green roofs in Annapolis. Check out the unique transformation of one of Annapolis' many street-end parks by the city and the Spa Creek Conservancy to build a Living Shoreline, Raingardens, the planting of native Bay grasses, and a small boat access to the water. Visit the site of the city’s original hospital that has been transformed into a vibrant community overlooking Spa Creek. History Stone – This granite stone in the Market House Plaza was dedicated on November 22, 1908 as the cornerstone of an intended fountain to commemorate Maryland’s 1649 Act of Toleration for religious freedom and to celebrate the 200th Anniversary of the City Charter. Due to a series of controversies over the design and funding, the fountain was never completed. The cornerstone was rededicated in 1929, as the city’s History Stone. In 2002 it was moved to the Market House Plaza where it sits with the hexagonal water basin for horses that was to be part of the fountain. Compass Rose – Located in the Market House Plaza is a bronze and granite Compass Rose. Late in life, sculptor Edward Dwight received a Fine Arts Degree from the University of Denver. A figurative artist, his early work portrays the history of Jazz. His studio is in Denver, Colorado. Kunta Kinte-Alex Haley Memorial – This monument is the only one of its kind that actually documents the name of an African-American slave Kunta Kinte, and the place of his arrival in Annapolis in 1767. The memorial was conceived and initiated by Leonard Blackshear, designed by Annapolitans Peter Tasi and Gary Schwertzler, aided by artist Patricia McHold and writer Wiley Hall III. This bronze statue of a seated Alex Haley, reading to three small children was sculpted by Edward Dwight, a test pilot for the USAF, and the first African-American trained as an astronaut. 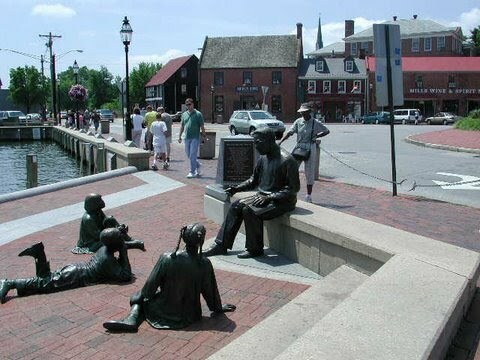 Ten bronze plaques along Compromise Street and the Harbor offer stories and valuable insights from the book Roots by Alex Haley. Haley did the research for his monumental novel at the Hall of Records here in Annapolis. Stop # 12 – John Barry Memorial (5 minutes) – For decades, the Ancient Order of Hibernions in America petitioned the United States Naval Academy to honor a true Irish-American naval hero of the American Revolution. Commodore John Barry supervised the building of the first U.S. Navy ships in 1797, including the frigate United States. The memorial was dedicated in 2015. This is the only Visitor Entrance into the Naval Academy and requires a photo ID. Thurgood Marshall Memorial – Dedicated in 1996 to the first African-American Justice of the U.S. Supreme Court, Baltimore-born Thurgood Marshall, this bronze statue is the work of Maryland-based sculptor Antonio Tobias (Toby) Mendez who is also known for his depictions of the stars of the Baltimore Orioles baseball team. The memorial also honors Marshall’s most celebrated legal victory Brown v Board of Education which desegregated America’s school. The Annapolis EcoFun Tour is 5.5 miles long and will take about 2 hours. We meet at the Calvert Street Garage, next to historic St. John’s College, at 2:45 PM, for our safety orientation and equipment check. We leave promptly at 3 PM and will not wait for stragglers unless they call to alert the tour guide.